In the summer of 1915, immigrant workers in Bridgeport, Connecticut, took advantage of the wartime boom and went on strike to demand an eight-hour work day, better wages, and improved working conditions. Skilled craftsmen led the strike, but when 11,000 less-skilled workers (many of them young women) joined the movement, it turned into a city-wide general strike. What were the causes of the labor unrest that roiled Connecticut in the years between 1900 and World War I? What did the editors of the Norwich Bulletin suspect about the roots of the 1915 Bridgeport strikes? What picture do the articles from the Bridgeport Evening Farmer paint about the origin of the 1915 Bridgeport strikes? How did the U.S. Commission on Industrial Relations explain labor unrest to Congress in its 1914 report? 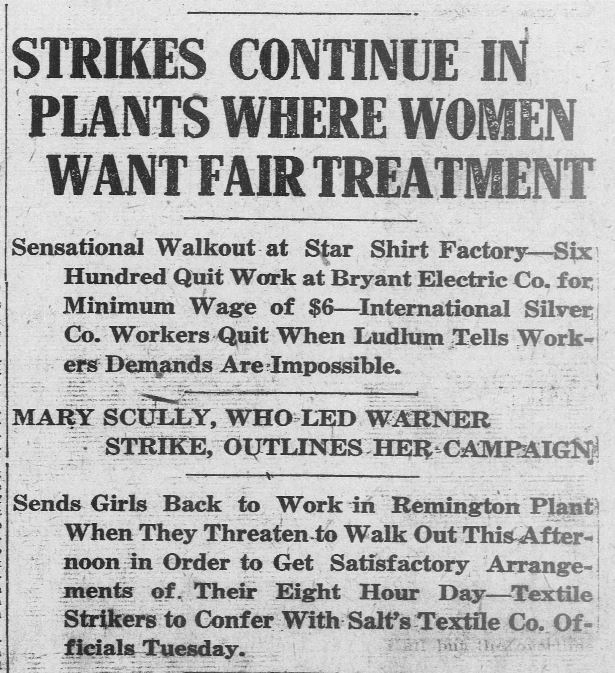 “26,000 Women Workers Will Have Better Conditions in Bridgeport: Strikes Continue In Plants Where Women Want Fair Treatment,” Bridgeport Evening Farmer, August 20, 1915 – Library of Congress, Chronicling America: Historic American Newspapers. “Enthusiasm Marks Mass Meeting of Striking Warner Operatives,” Bridgeport Evening Farmer, August 17, 1915 – Library of Congress, Chronicling America: Historic American Newspapers. “The Bridgeport Situation,” Norwich Bulletin, July 20, 1915 – Library of Congress, Chronicling America: Historic American Newspapers. 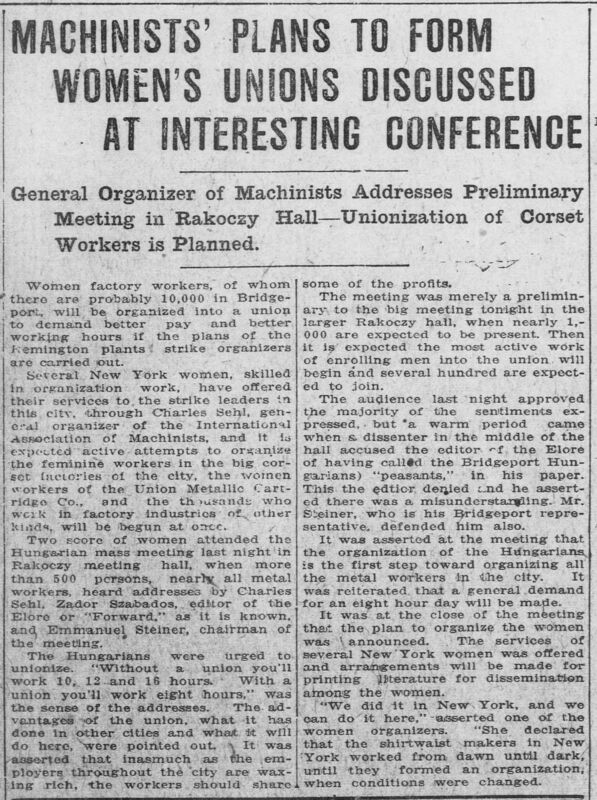 “Machinists’ Plan to Form Women’s Unions Discussed at Interesting Conference,” Bridgeport Evening Farmer, July 21, 1915 – Library of Congress, Chronicling America: Historic American Newspapers. “Low Wages and Desire for Better Living Conditions Causes of Labor Unrest: Industrial Committee Cites Reasons of Employers and Employees in Report to Congress,” Bridgeport Evening Farmer, December 8, 1914 – Library of Congress, Chronicling America: Historic American Newspapers. Group 1: “The Bridgeport Situation,” Norwich Bulletin, July 20, 1915, and “Machinists’ Plan to Form Women’s Unions Discussed at Interesting Conference,” Bridgeport Evening Farmer, July 21, 1915. 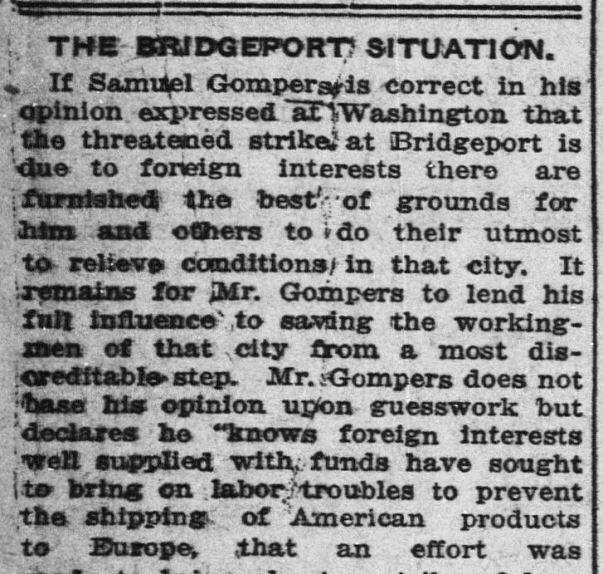 Group 2: “26,000 Women Workers Will Have Better Conditions in Bridgeport,” Bridgeport Evening Farmer, August 20, 1915. 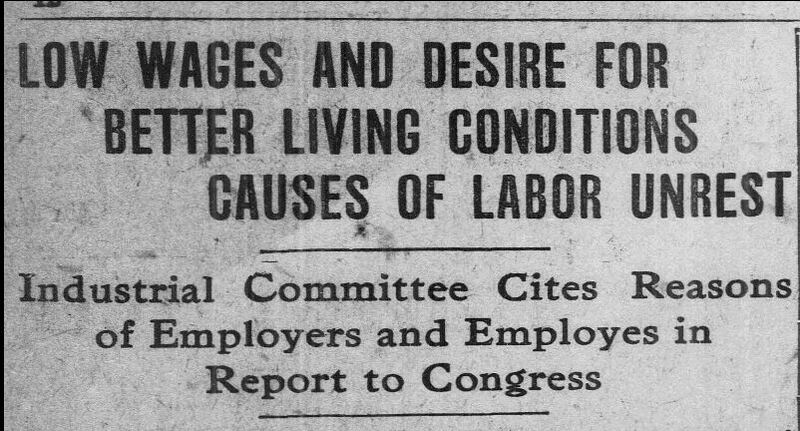 Group 4: “Low Wages and Desire for Better Living Conditions Causes of Labor Unrest: Industrial Committee Cites Reasons of Employers and Employees in Report to Congress,” Bridgeport Evening Farmer, December 8, 1914. What industries were involved? What type of work did the laborers do? What were the workers’ concerns and demands? What were the concerns of management? What, if any, outside influences were there? 3. Students should then list the questions that each source and argument provokes. Have the students consider what additional sources they might seek to answer those questions. 4. Ask the students to suggest reasons why the different sources might offer divergent explanations for the Bridgeport situation. 5. Ask the students, after considering the various points of view provided, to develop a working hypothesis about the cause of Bridgeport’s labor unrest that could guide a more in-depth research project. 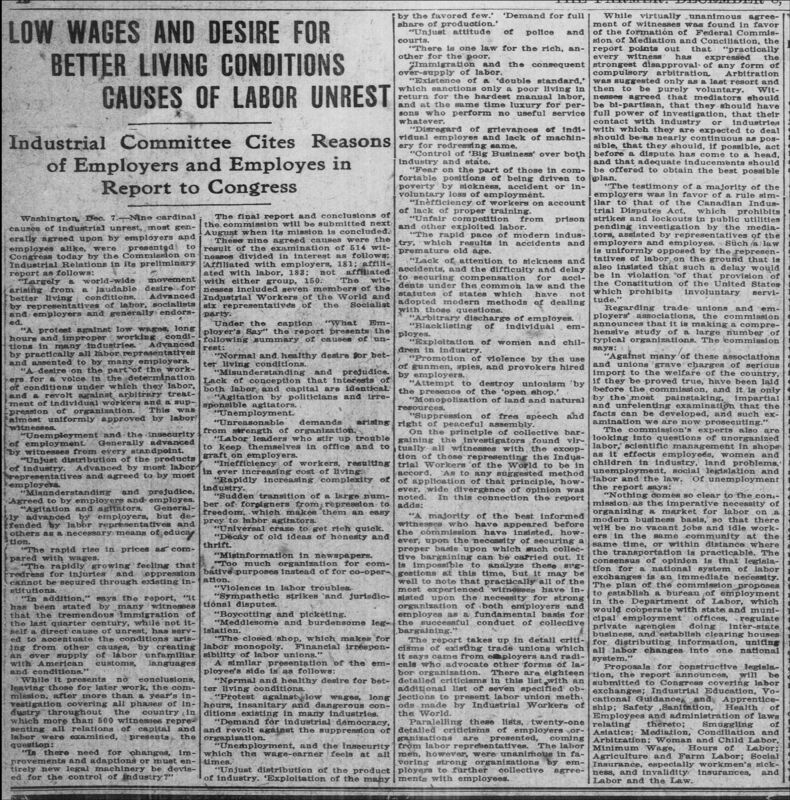 For additional information and opinions about labor unrest in 1915, students can use the Chronicling America database of historic newspapers. Students will be divided into two groups—one representing labor and the other management in 1915. Develop arguments based on the newspaper sources (plus additional primary and secondary sources you may have used in the classroom) and hold a debate on the issues of labor conditions, wages, and the length of the work day/week. Students will use what they have learned from the newspaper accounts (and any other resources on the topic you have used in the classroom) to create their own picket signs for workers striking in 1915 Connecticut. Students will use newspapers, the internet, and other sources to investigate labor issues in Connecticut today, including the campaign for a $15 minimum wage and new federal overtime rules. They will create a graphic organizer comparing the issues today to those in 1915 (concerns, demands, industries involved, types of work done by laborers, etc.). Students may then write a letter to their state legislator arguing their own position on these topics and placing them in historical context. Visit the Bridgeport History Center to learn more about the impact of the World War I labor movement on the history of 20th-century Bridgeport. For more information or to set up a visit, email hclibrarian@bridgeportpubliclibrary.org or visit the website. The UConn Archives and Special Collections at the Thomas J. Dodd Research Center holds labor history collections. For more information or to set up a visit, email archives@uconn.edu or visit the website. Visit the Windham Textile Museum’s website to learn about the life of working people in the “Textile City” before and after the great Bridgeport strike wave of 1915. “When Bridgeport Women Won the Eight Hour Day,” Connecticut Digital Newspaper Project. “Augusta Lewis Troup” – Biography of Connecticut suffragist and labor organizer, Connecticut Women’s Hall of Fame. “Bridgeport Women Workers and the Birth of the Eight Hour Day,” New England Historical Society. “Women and the Progressive Movement by Miriam Cohen,” The Gilder Lehrman Institute of American History.